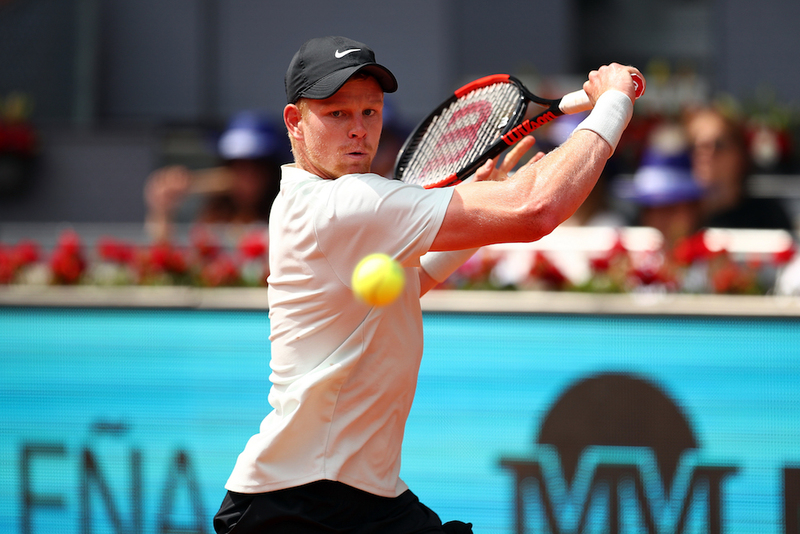 MADRID, SPAIN – Kyle Edmund downed Novak Djokovic to set up a third round match-up with David Goffin. There is a lot to be said for the confidence of wins under your belt, and the run to the Estoril final seemed to pay off dividends as British No. 1 Kyle Edmund halted two-time Madrid champion Novak Djokovic, as the former World No. 1 still searches for consistency. Edmund roared off the blocks with an immediate break, only to be pegged straight back but the Brit took his chance in the middle of the set to take the lead once more. He went on to break Djokovic for the set. However, the momentum shifted with Djokovic immediately breaking at the start of the second set and securing a double-break cushion to level things up. Coming into this season Djokovic has yet to come out on the winning end of a third set decider and having squandered three break points. It took just a simple break and a serve to love for Edmund to register one of the biggest wins of his career. After the match he said: “It’s a great win for me. I mean, he’s won this event twice. It’s obviously more than that. He’s a legend of the game. One of the best tennis players of all time. So, yeah, it’s a really good win for me. He continued: “To beat a big name, you know what he’s done in the game, the pressures that come with that. Djokovic, who came into press immediately after his loss, was very complementary about a new British No. 1 on the scene. “He has improved. His forehand is obviously his weapon and he has been using it very well, backing up the serve with that forehand. Backhand, he has improved his backhand, down the line. Couple important points he won with that shot today. Few who were there can forget how a young Edmund, making his debut for Team GB in the Davis Cup Final no less, forced the far more experienced David Goffin to play a full five sets to et the win. Back in those days and for a year or so afterwards, Edmund’s body would let him down as he struggled to control cramping, especially in the heat of five-set battle – but now those days seem a long time gone. There have been a couple of freak injuries that have halted the otherwise steady consistency of Goffin but his credentials on the clay this year have seen him reach the quarter-finals of the Monte Carlo Masters, and the semi-final in Barcelona. Goffin’s strength is his movement and groundstrokes, although the Belgian does lack the firepower, and this is where Edmund could really do some damage. The altitude has really suited Edmund’s game and his serve and forehand were firing well today. But it is the visible improvement in his movement and coming forward at the net, his finesse when there, and the improvements to his backhand that really made the difference today. Edmund said, about the upcoming encounter: “Last time I played him, the only time I played him, was obviously at that Davis Cup match. Very intense match. Big experience for me playing obviously my first Davis Cup in the Final away in Belgium. So much experience learnt from that. Prediction: Edmund in three sets. Follow Britwatch - Sport in General, Brits in Particular! 🎾All hail the comeback queens! Konta and Boulter get GB over the line, as Keothavong celebrates the strength in depth in her team! LONDON, ENGLAND – It was a day for the comeback queens as Katie Boulter came from a set down to beat Zarina Diyas in three sets to send Great Britain back into the World’s elite. LONDON, ENGLAND – Great Britain are just one win away from a spot in the Fed Cup elite World Group II after Johanna Konta came from behind again to put the hosts in front. LONDON, ENGLAND – All to play for, or an uphill battle, as Johanna Konta and an ailing Katie Boulter go again in a bid to advance Great Britain to World Group II. LONDON, ENGLAND – British No. 2 Katie Boulter was edged in a heart-breaker of a match as Yulia Putintseva levelled the play-off. LONDON, ENGLAND – In another tough battle, Johanna Konta gave GB a lead in the Fed Cup World Group II play-off with a three-set win over Zarina Diyas.